Before some 400 guests at a black-tie dinner on Saturday, October 11, 2008, Boston College announced its $1.5 billion fund drive called “Light the World.” Subtitled “The 150th Anniversary Campaign for Boston College,” the seven-year effort debuted with $520 million in cash and pledges accrued. The dinner took place on the new Brighton Campus in a glass-panel pavilion temporarily established on the rear lawn of what Boston College calls “The Residence”—the three-story Renaissance revival evocation of a Roman palace that Cardinal William O’Connell erected in 1927, on a hill above Commonwealth Avenue, as a seat for Boston’s archbishops. The Boston College Chorale sang. University President William P. Leahy, SJ, offered an invocation. A movie tendered brief profiles of six alumni who “light the world” through their work along with scenes of the annual torch-lighting ceremony below Gasson Tower during which freshmen wearing skirts and chinos (some of the latter even pressed) are commissioned to follow Ignatius’s instruction of 1540 to Francis Xavier “Ite inflammate omnia,” or “Go, set the world aflame.” At the movie’s conclusion, the best-kept secret on campus for six months, the campaign’s name, was publicly sounded and displayed for the first time. 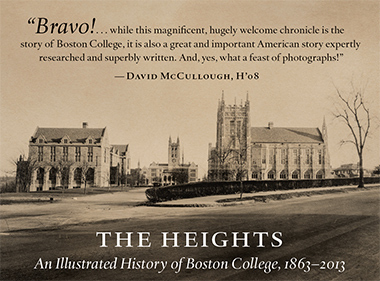 What lies ahead for Boston College students and alumni, we cannot know. But we do know that they will yearn for what we yearn for—peace, love, knowledge, wisdom, and faith. We are determined to build a better, stronger Boston College that will serve them and the societies in which they will live, a Boston College that will increasingly be a gift to the nations, a Boston College that will truly light the world. And at regular intervals behind his words, as behind every other speaker’s words and the Chorale’s “Alleluias” and the lush swellings of “For Boston” in the movie soundtrack, Green Line trolleys rattled along Commonwealth Avenue and sounded their bells as they rolled in and out of the station. Light the World is designed to achieve four aims. One is to double the number of alumni—from 750 today to 1,500 by the campaign’s conclusion—who volunteer to assist Boston College with chapters, reunions, admitted-student receptions, and career advising for students or other alumni. A third has to do with what is referred to, with some delicacy, as “legacy giving.” The aim is to increase the number of alumni who leave money to Boston College in their wills. The advancement office is aware, through attorney and donor notification, of 850 current “provisions.” The aspiration is to achieve awareness of 5,000. Less familiar is the small type, the project list, the answers to the only interesting question one can ask about a fundraising campaign: How is the institution going to be different when it’s over? If the dinner was the day’s signal event, lunch was its most striking, at least for me. For one thing, Dining Services delivered itself of an entrée 18 words long— “coriander and mustard seed crusted breast of chicken over tomato and arugula salad with marinated fingerling potato coins,” which I believe sets a Middle Campus record. And for another, the lunch featured the inaugural awarding of the “Andrew Carney Medal for Distinguished Lay Leadership,” which is named for an Irishman who arrived in America in 1816, made a fortune as a clothing manufacturer, sold his business and retired young, and became a pillar of philanthropy in the Boston Catholic community (Carney Hospital is one of his doings). Carney Dining Hall (no relation) was decorated for the awards lunch with long, gauzy white curtains that enclosed a stage and a group of about 200 guests gathered to honor the 11 former chairs of the Boston College Board of Trustees since its founding in November 1972 under then-president and current chancellor J. Donald Monan, SJ. It was Monan, just arrived at Boston College that summer, who’d had a dual insight. The first part was that sans the investment of counsel and money by lay men and women, Boston College—however sharp the Jesuits who ran it—was likely doomed to frailty at best (it had come close to bankruptcy just two years earlier). The second part was that few persons of heft and quality (the only kind of person from whom Monan, at least, was going to take counsel) would be willing to invest deeply in a corporation for which they did not feel responsible. And so a board of trustees whose members were drawn from useful quarters of the alumni world took charge of Boston College, and the Jesuit community, which had heretofore exercised legal ownership, relinquished it. What Andrew Carney had been for McElroy, the 11 men who were to be honored on October 11 had been for Monan and Leahy. Seven were present at the lunch ceremony, and the others were represented by family members or friends, all taking seats in a row on stage between master of ceremonies Bill Geary at the lectern, and Monan and Leahy seated at stage right, an Irish (almost entirely) Mount Rushmore. The presentations were moving, as tend to be all ceremonies in which gray-haired men or women rise to be recognized for extraordinary work they did in their full strength. Among the accomplishments cited were making the deal for the Newton Campus (Owens); leading the first professionally managed capital campaign (O’Neill, from 1976 to 1981, and amounting to $25 million); and hoisting Boston College’s banner on Wall Street (Boisi). A particularly touching moment took place when Geary, out of sensitivity for Tom Galligan’s age and physical condition—he walks with the aid of a cane—avoided asking him to rise when he was to receive the medal from Monan. But Galligan, ignoring the young board leader’s particular consideration, grasped the arms of his chair and thrust down like a gymnast at the parallel bars, boosting himself once, twice, three times, until he was able to gain his footing, and some of us were able to breathe again. It was a courtesy note, and it was followed by about 10 seconds of appropriately warm applause, and then the applause grew more than warm and people began to stand (the indomitable Mr. Galligan again, too), and they stood and applauded for another 35 seconds, the awardees on stage walking toward Monan as they clapped their hands until they and Fr. Leahy nearly surrounded him. Monan, seated in his chair, looked out at the room with his usual cool gaze, as though he were watching an adequate sunset from the porch. And then his right hand swiped at the outer corner of his right eye, and then his jaw quivered, and he turned away for a moment, and when he turned back he was Rev. J. Donald Monan, SJ, again, but barely. Shortly after landing in Boston in the summer of 1978, I took a job as a public relations writer at Boston College—an institution I’d not heard of until the day I saw the position advertised—and soon learned that “BC” was one of those local institutions, like the Red Sox, clam shacks, the T, or Filene’s Basement, on which every native was prepared to offer expert commentary. The wisdom sometimes took unexpected form. In a mold-fragrant used furniture store in Allston, where I’d come seeking some nursery furnishing for an incipient child, I was tutored as to my new employer by the establishment’s manager, an ancient mariner seated in a worn armchair with a view of spectacular collections of tarnished toasters and hotel ashtrays. He explained, “BC girls are pretty, and the boys are good-looking, too.” I laughed, but he didn’t. But by then the headwinds were already blowing. Some of the storms—such as civil rights, the baby boomer surge, women’s rights, Vietnam, and the re-jigging of all sorts of cultural mores and tastes—howled through every campus quad. Others were particular to Catholic colleges and included Vatican II, departures from the religious orders that staffed these colleges and that were in many cases their only meaningful endowment, and, most significantly, the falling away of the hyphen that had historically separated “American” from “Catholic” in common locution and imagination (and in Catholic imagination no less than in other kinds). This revolution in grammar was most publicly evidenced by John F. Kennedy’s election to the presidency. But it was no less manifest in the Catholic abandonment of the “ethnic urban village”—Boston College’s Plymouth Rock, and the source of many of its tuition-paying students—for huddles of three-bedroom colonials on Crabapple Circle, and in the swelling of a host of other ambitions in Catholic American hearts, including the yearning to educate sons and daughters at the best colleges in the country, even if these were called Harvard, Smith, or Wesleyan. Boston College did not quite go down in this hard weather, but it was blown far off its old course, and in 1978, when Jim McGahay pulled me on board, the institution was arduously tacking its way back and forth toward a new home port—as a nationally prominent university, it was rumored—an objective whose existence somewhere over the horizon did not on every day seem a sure thing (even if Monan always claimed that it was). In the subsequent years, I had reason to quote Jim’s words (occasionally with attribution) in explaining to members of my staff why Boston College didn’t always work like other universities they’d known, and in explaining to friends why the place continued to hold my attention, and most recently, if less frequently, in conversation with new arrivals who turn to me—the now-grizzled éminence grise—to hear the ancient story. And of course I thought of Jim’s words in the days after Light the World was launched. But in largest part, it’s the thematic goals that Leahy proffered in his speech and that I have heard deliberated at strategic planning sessions and briefings going back four years (though sometimes I think 30). You could quarrel with these from a number of perspectives, I imagine (or know very well), but not, it seems to me, from the basis that they aren’t central to what Boston College, with clarity, knows itself to be, after a near half century of sometimes arduous becoming. Emerson wrote of human beings that we find our way through the world like sailing ships, by a series of tacks that only make straight-line sense when viewed from a very high (celestial, perhaps) altitude. The same holds true for human institutions. I’m going to guess that the neighborhood school founded by McElroy in 1863 seemed a wobbly proposition to its exponents on many days over the early decades; and that supporters of the local college and later university established by Gasson at the western edge of the city in 1913 felt similarly challenged: by world wars, by economic depression, by the difference between 1915 and 1965. And the concerns were ultimately legitimate, because those two Boston Colleges are now gone, having left legacies that include this Boston College, which, bearing the responsibilities and hopes (and concerns) of its own place and time, continues the voyage, heading for a harbor that, if we play our cards right, will always be over the horizon. Our stories on five campus manifestations of Light the World begin here.